Lip biting is a nonverbal signal which indicates a number of different emotional states. Like all body language, if you only look for one sign - you will very often reach a false conclusion. This is akin to the multiple meanings of a single spoken or written word. "Hot" can describe a woman's attractiveness, the temperature outside or the taste of a red chili pepper. The need to observe all the nonverbals, the language and the paralanguage - and interpret them together in cluster and in context - cannot be overemphasized. In the midst of intense physical activity, lip biting is very common - although there are several other meanings and contexts for this nonverbal. 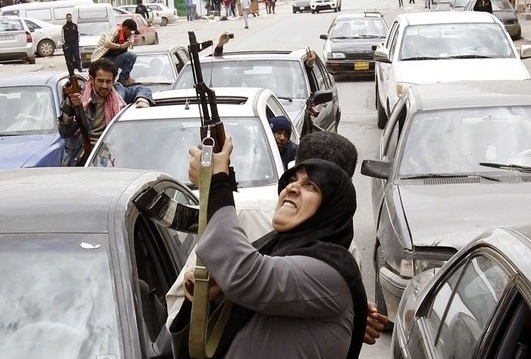 Above, a woman fires an AK-47 into the air in Benghazi, Libya on March 19, 2011. 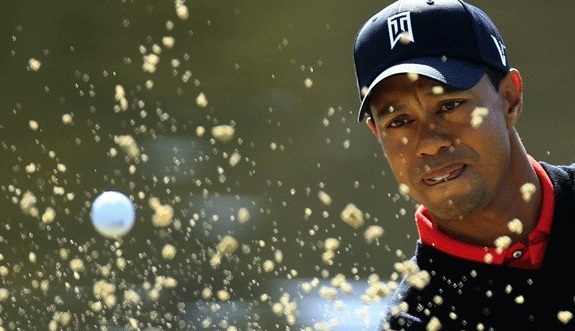 Below, Tiger Woods has just swung his sand wedge. Both are biting their lower lips. The Libyan woman is, at least partially, in a celebratory emotional state known as "Fiero" upon hearing of Muammar Gaddafi's withdrawl from the city (see Sincerity Secret # 20: Fiero Feels Good - Mirror Neurons). Fiero can often resemble a state of physical pain or anger. Tiger is also in the middle of a physical act - and the intensity here is primarily highly focus concentration. Both are physical acts - and while one is associated with a great release of emotion and physicality - the other is great focus of emotion and body.